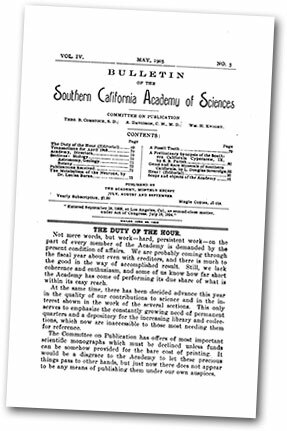 Five articles about gemstones and mining in Southern California, published between 1903 and 1911, in a variety of publications. Vol. XLII, No. 12 (19 Sep. 1903), pp. 481–482. With the advent of Kunzite, the newly-discovered gem, and its remarkable behavior when subjected to the action of radio-active substances and electromagnetic radiations as observed by Dr. George Frederic Kunz, late president of the New York Mineralogical Club, and Prof. Charles Baskerville, head of the chemical department of the University of North Carolina, fresh stimulus has been given to the study of the new properties of minerals acquired in a radio-active field. Before presenting these remarkable phenomena a brief history of the stone named in honor of Dr. Kunz will be given. A gem believed by mineralogists to be extinct was noted by Dr. Kunz in his treatise on precious stones  some ten years ago, the data being obtained from spodumene, a mineral generally found in large, opaque whitish crystals, but which sometimes appears as highly colored transparent specimens of very small size. These are the clear yellow gem-spodumene of Brazil , the green variety known as hiddenite or lithia emerald of North Carolina [3; this reference mark is missing from the original text], and the lilac or amethystine specimens found occasionally at Branchville, Conn. These minute crystals are plainly remnants of what must have once been elegant specimens,  but this special spodumene was extremely susceptible to alteration, and the finer properties of the larger specimens have been destroyed through their environments and their transparency and beauty of tint eliminated. From these remaining fragments the doctor was enabled to approximate their appearance when in the perfect state and classified as precious stones. Nearly nine months ago spodumene crystals, unaltered, transparent and of a rich lilac color were discovered near Pala, California, and specimens were sent to Dr. Kunz for classification, and it was ascertained by him that these were not only different from all other minerals heretofore examined, but also fulfilled to a nicety the conditions exacted by the extinct stone previously described in his work. These newly-discovered crystals of spodumene measured 10 x 20 x 4 centimeters and are not only of extraordinary size, but are of exceeding beauty and transparency as well; in color they vary from a rich deep rosy lilac to pale and almost colorless crystals, depending on the depth from which they are obtained, the striking colors being found at considerable depths and the colorless varieties near the surface of the earth. Up to a very recent date this new gem was without a name, but while Dr. Kunz was on his vacation Prof. Baskerville, in view of the acute observations of the eminent mineralogist, cleverly proposed the name of Kunzite, which was heartily received by scientists both at home and abroad. Fig. 1 illustrates photographically crystals of Kunzite, the size being relatively indicated. The dimensions and weights of six of the largest crystals are here appended. Weight, grains. Weight, troy. Dimensions, centimeters. 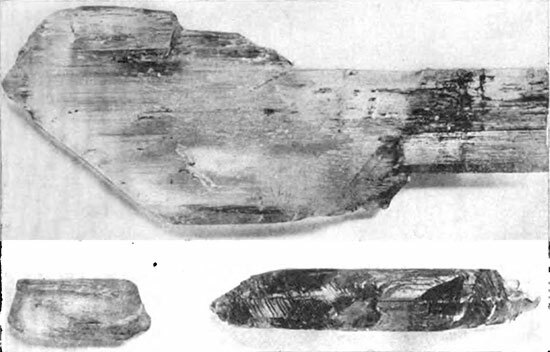 Dr. Kunz and Prof. Baskerville have subjected these magnificent crystals to the bombardment of the Röntgen rays having high penetrative powers, yet on examining the stone in a dark room they emitted a white light for as long a period as twenty minutes, whereas with all other specimens of altered and unaltered spodumene obtained from Brazil, North Carolina and Connecticut included in all the private and public collections available, none was found to produce a similar effect. Again, it was found that a crystal 2x4x10 centimeters, excited by a stream of Röntgen rays for a few minutes, set up a secondary radiation by which a radiograph of the crystal itself was easily made on a sensitized paper by its own emanations, and even when thin paper was interposed between the radio-active crystal and the light sensitive paper the radiation still was active. These savants have shown that this phosphorescent property is not confined merely to the surface of the crystal but persists throughout its mass. Fig. 2 is a radiograph of Kunzite crystal made with a 12-in. spark coil and a self-regulating tube, with an exposure of 60 seconds. Oppositely disposed, ultra-violet radiation does not produce the slightest indication of fluorescence or phosphorescence when Kunzite is subjected to its action. Fig. 2.—Radiograph of a Kunzite crystal. The Kunzite is highly dichroic in the darker specimens, and with the dichroscope the darker specimens show a rich, deep purple for ordinary rays, and a pink for the extraordinary rays. For a lighter crystal, almost like pink topaz in color, the ordinary ray is transformed into pink, and the extraordinary ray showed almost no color, having an approximately white appearance. 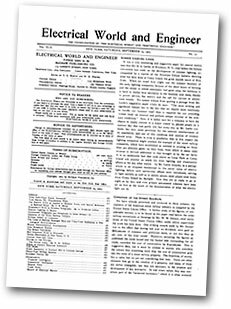 A small quantity of radium of 300,000 radio-activity and the purest yet received in this country reached the American Museum of Natural History (New York City) a few days ago, sealed in a small glass tube with an outer casing of lead-foil, the total diameter being about 3 centimetres. This, as well as a quantity of 7.000 activity was employed by Dr. Kunz and his colleague, Prof. Baskerville, in the examination of the hitherto unrevealed properties inherent in gems. Not only was Kunzite subjected to its searching influence, but the entire Bement-Morgan collection—over 13,000 specimens in number—and the Morgan-Tiffany collection of gems containing several thousand specimens, together with some thousands of different diamonds and a large number of gems and minerals, were investigated. Fig. 3.—Gems cut and polished. Fig. 3 shows two forms of Kunzite gems cut and polished, and it was ascertained that after these specimens were influenced by the radium they emitted a wonderful phosphorescence. Figs. 4 and 5 illustrate how the experimenters protected themselves from the untoward effects of the radium—such as it may possess. 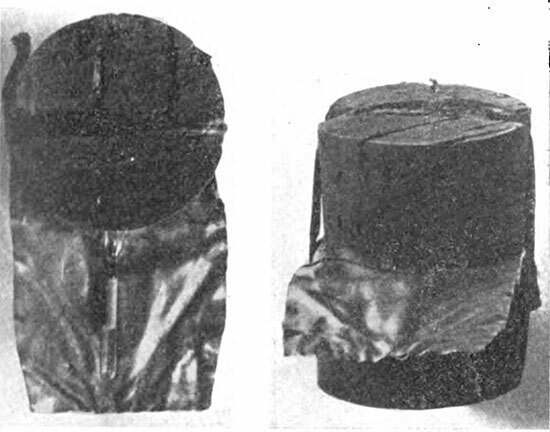 Two corks with a piece of lead-foil inserted between them was securely fastened together with the tube of radium suspended over it, as shown in Fig. 4. which is a top elevation. Fig. 5 shows the lead-foil projecting forward and the little apparatus in position so that the radium will emit its corpuscles directly on the gem held under it. The tube is snugly tucked away, not only that it may not sustain damage to itself but so, too, it may not accidentally sear the flesh or destroy the vision of those in whose keeping it is entrusted. Figs. 4 and 5.—Radium tube of 300,000 radio-activity. 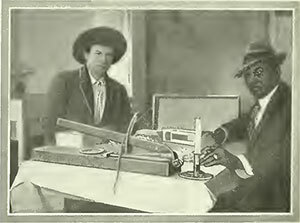 The radium, now the property of the Museum, was acquired through the courteous gift of Edward D. Adams, Esq., for the especial purpose of the researches recited above. By its aid diamonds exhibit a marked phosphorescent property, which they retained for a time after the stones are removed; other diamonds, on the other hand, do not phosphoresce at all; this striking example was most notable in a cut gem weighing 15½ carats, of a beautiful white color and from an unknown Brazilian locality; others of the same class were uncut gems found in British Guiana, and a large diamond weighing 16 carats found at Eagle, Wis. The mineral Willemite exhibited a fluorescence and phosphorescence, and Wollastonite a marvelous phosphorescence, but the new gem, Kunzite, phosphoresced with a greater brilliancy than any other substance examined with radium. When the radio-active matter was held under the entire gem, which measured an inch in diameter, an inch in depth and weighing 55 5-16 carats, it glowed with an orange-red color, and its phosphorescent emissions penetrated from three to six sheets of paper. It is pleasing to note that this work has been taken up by men so remarkably well qualified as Dr. Kunz and Prof. Baskerville. The latter is a graduate of the University of Virginia and is Professor of Chemistry in the University of North Carolina, Chapel Hill, N. C., and has made extensive researches in what is known as rare earths, which have attracted so much attention in recent years, as it is the incandescence of these earthly minerals that has been the subject of so much experimenting in gas and electric lighting. Dr. George F. Kunz first gave his attention to the subject of phosphorescence about 1875, and in April, 1876, he read a paper before the New York Lyceum of Natural History on the phosphorescence of pectolite by attrition as a distinguishing characteristic between it and the fibrous zeolites. He next made a series of experiments on the phosphorescence of the diamond at the Paris Exposition of 1889 jointly with Prof. E. Mascart, the well-known electrician. Prof. Kunz continued his researches on his return to America, and finally deduced the sweeping law that all diamonds phosphoresce by attrition. He published a statement to the effect that certain diamonds from Brazil absorbed sunlight and some of them ultra-violet radiation, which they emitted in the dark in the form of light waves, and that this effect was due to the presence of some substance, possibly a hydro-carbon, to which he gave the name of Tiffanyite. This phenomenon was shown in an electrical exhibition at Grand Central Palace, New York, in 1896, for an entire month, where it was viewed by thousands of spectators. 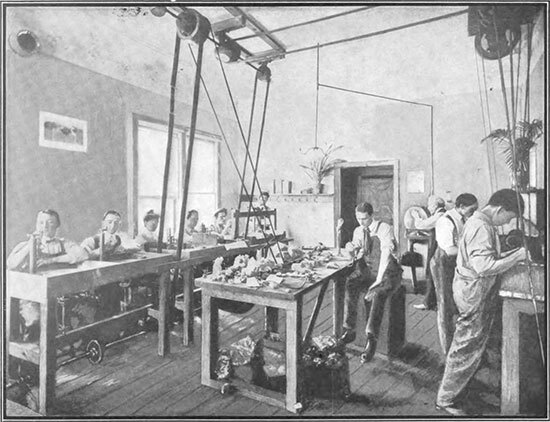 The experiment was conducted in a specially-constructed room, where the diamonds were shown in white light and under ultra-violet radiation, and then allowed to phosphoresce in the dark. Dr. Kunz discovered as early as 1887 that chlorophane, a mineral from Amelia County, Va., emitted light by attrition, and that it phosphoresced by the glow of the hand, which proved to be a distinguishing characteristic between it and other varieties of fluorites. He has also made an exhaustive study of fireflies and glow worms, both in the United States and Europe and Asiatic Russia. With this wide experience in testing gems, together with the subtle aid which X-rays, ultra-violet radiation and radio-active substances will give in the exploration of regions hitherto inaccessible through the medium of microscopy, spectrum analysis and chemical analysis, we must not be surprised if phenomena even more noteworthy be presented for our consideration. For twenty-one years Dr. Kunz has been a special agent in charge of precious stones for the United States Geological Survey; received the honorary degree of Ph.D. from University of Marburg, Germany, and A. M., Columbia University. Vol. IV, No. 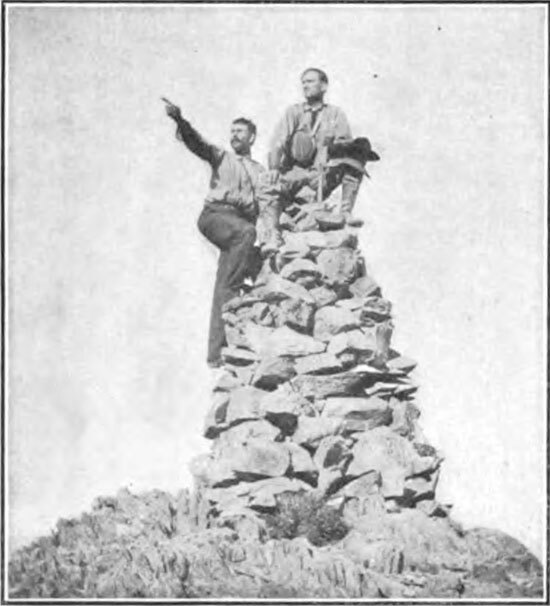 5 (May 1905), pp. 85–90. Hidden deep in the heart of the heat distorted Colorado Desert, in San Diego County, guarded by great naked buttes that frown down upon the intrepid prospector, is probably one of the richest of Nature’s unrifled coffers of crystaline wealth. This little southwestern corner of the country, embracing the desert waste and the low mountain range between it and the sea, might well be named the jewel casket of the United States. 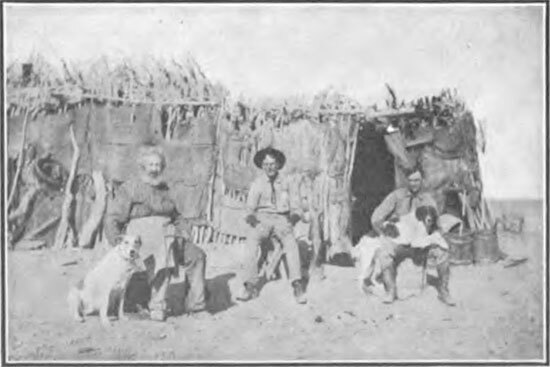 Though as yet only the hardiest of prospectors have ventured from the beaten trails that mark the shortest route from water-hole to water-hole, those who have dared have either left their bones to whiten on the arid plain or been rewarded by evidence of vast undeveloped wealth. Where the prospector’s pick has uncovered those closely guarded secrets in this remarkable section, finds of commercial importance and of great scientific interest have been recorded. There is probably no known section in the world that today offers the gem hunter greater possibilities, and there are few fields offering the geologist greater reward for research. The astonishing discovery of rare minerals and unsurpassed crystals in the dwarf mountains to the west have comparatively recently brought this section into prominence. 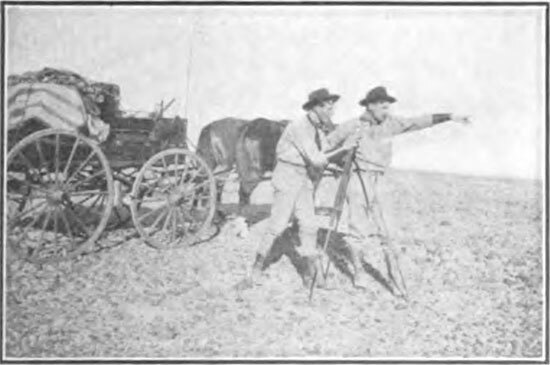 The finding of the richest and most productive known deposit of tourmaline crystals, the uncovering of the only known deposit of lilac-colored spodumene and the discovery and development of lepidolite in quantities never dreamed of before the uncovering of the Pala dike, are among its claims to distinction. 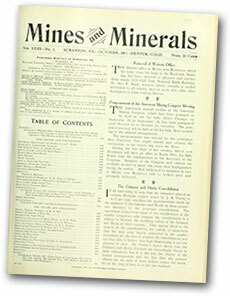 In importance the discovery of the lepidolite deposit, where development has brought to light immense quantities of ores of lithia, estimated by the thousands of tons, probably ranks first. The locality, without doubt, is unequaled in the world for its abundance of lithia minerals, as the deposit contains, besides high grade lepidolite ore, immense quantities of amblygonite. The Pala mines would be interesting from almost any point of view. To the scientist the geology of the great dike of lithium bearing muscovite, tracked for hundreds of feet by well defined croppings, affords a study worthy of his best efforts. Commercially this deposit is of importance. Its principal value lies in the lithia the ore contains, carrying as it does on an average, close to 5%. Salts and tablets have been manufactured from the lithia extracted from this ore, and were the deposit reduced and converted into tablets there would be sufficient to meet the world’s demand for generations to come or to convert one of our country’s fresh water lakes into a great effervescent sea of trouble. This ore contains close to 50% silica, 25% alumina, 12½% potash and soda and small quantities of iron, manganese, flourine [sic], lime and magnesia. Aside from its importance as a lithia producer, its other properties give it almost as much value. In its reduction the lithia and potash can be extracted cheaply, and these are of course always marketable, but in this case the residuum would be of little value. If however the potash remains and only the lithia be removed, the remaining material will make a most beautiful opal glass; or by mixing it with good quality of kaolin, porcelain, or china, of great beauty can be manufactured at small cost. By taking the balance, after extracting the lithia and potash, and combining it with the necessary proportions of lime or limestone, and calcining and grinding, a good quality of Portland cement is the result. So far as known, I believe, these are the only applications made up to this time, although it is more than likely that others will suggest themselves when the reduction of the ore is begun on a large scale. The amblygonite, a lithium-aluminum phosphate, found associated with the lepidolite, is even more valuable from a commercial standpoint. Besides carrying a higher percentage of lithia than the lepidolite ore, averaging over 8%, it contains 46% phosphorus, over 33% alumina, with silica, lime, potash and manganese in small quantities. After extracting the lithia from the amblygonite there remains a large amount of available phosphorus and alumina, the former at least of considerable value. It is used in various ways in the arts and sciences and is in demand in any amount obtainable as a fertilizing agent. The alumina can be produced as a sulphate to be used by dryers, paper makers or converted into alum. It has been estimated that the byproducts after the lithia is extracted are of sufficient value to pay all the expense of the reduction of the ore, leaving the lithia as a profit. To the layman, unacquainted with its commercial value and scientific importance, the deposit could not fail to be of interest as it is impressively beautiful. The colors of the ore range from rose pink through a variety of shades of violet gray to yellowish and whitish. It occurs in granular masses made up of foliated scales. Probably the most striking and beautiful ore is that in which rubellite crystals are found entirely embedded in the lepidolite, the rubellite appearing as pink radiations in dark gangue of lilac-colored lepidolite. Those who have been permitted to inspect the workings have marveled at the wonder-hand of Nature. From the rocky slope one plunges into the yawning mouth of a tunnel that zig zags its way to the ledge that lies between walls of pegmatyte, or muscovite-granite and quartz. In places, this quartz is deeply stained by bismuth and decomposed rubellite. The first stope, broken in along the contact of the ledge and pegmatyte, is like a grotto in Aladdin’s cave. Embedded in the walls on one side the rubellite is found in great radiations, like clusters of pink chrysanthemums on a background of lilac that shades to deep blue. On the other side the milky white pegmatyte, with large brilliant scales of mica, gives an attractive setting for the jet black crystals of tourmaline that are also found in radiations in this rock. The light of a single candle is caught up by the millions of scales and reflected over and over until the effect is dazzling. This stope has been named by the workmen the “Bridal Chamber”. This deposit has attracted to it scientists from many corners of the world, German chemists being especially interested by reason of its lithia contents, as at present the principal supply of tablets is manufactured in that country. Less than half a mile northeast of this deposit, across the canyon and near the summit of the western slope, is the famous Kunzite mine. Here less than three years ago was unearthed a most remarkable deposit of unaltered lilac-colored spodumene. These crystals were beautiful in their color tones, varying from deep rosy lilac to pale or almost colorless—a striking contrast to the rich deep pink-purple found at a greater depth. This is the only known lilac-colored spodumene deposit in the world, and is most valuable for its beauty as a gem. Crystals to the value of many thousands of dollars have been taken from the ledge, and within the past thirty days several new pockets containing many valuable crystals have been opened. Hiddenite, or lithia emerald, is a variety of spodumene varying in color from a yellow green to a deep emerald green tinged with yellow. Like Kunzite this is at present known to but one locality (Stony Point in North Carolina), but knowing ones predict that development will also expose this valuable gem crystal at the Pala mines. Kunzite is found in metamorphic rocks, generally gneiss or mica schist. The rock is a coarse decomposed granite, the feldspar much kaolinized and reduced to red dirt. The crystals occur in a vein with rutile, tourmaline, black oxide of manganese and lepidolite. There are also quantities of quartz crystals. I have seen quartz crystals extracted from the ledge that weighed hundreds of pounds, many having perfectly formed terminations. The mining of this gem crystal is done in the most crude fashion from open cuts following the outcrop, the crystals occurring in pockets. In this same deposit gem tourmaline crystals are also found, but for the most part these are small. Above the lepidolite, however, and near the same ledge, some work has been done resulting in the exposure of clear tourmaline of very unusual nine colors. These are very rare and are not of large size. At Mesa Grande, forty miles east and north of the Pala mines, is probably the largest ledge deposit of tourmaline crystals of gem quality known. 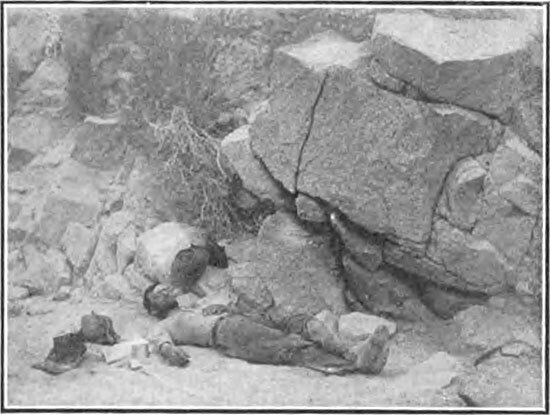 While prospecting in the mountains in this locality a large ledge was discovered that appeared to he a mass of lepidolite. The first blast showed the lepidolite to be present in large quantities, but in larger and more brilliant scales than that at Pala. Subsequent development showed that both in the lepidolite and associated quartz were magnificent crystals of tourmaline, the rubellite variety predominating. These deposits are now worked through a tunnel and, since the discovery, crystals to the value of thousands of dollars have been mined and cut into gems. Many of these crystals are translucent, or even transparent, and occur as large, separate crystals with perfect prisms and terminations. The habit of the crystals is very interesting, in that many of them, when doubly terminated, end in a flat, basal form of pyramid, and are not hemimorphic, as tourmalines generally are. The question of color is also of interest. Some specimens are of one color only; others are green, then yellow, red and finally green; others are crimson, tipped with black, or dark green passing into blue. In some specimens the different colors pass imperceptibly one into another; in others the line of demarkation is well defined. I had some cut crystals mined at Mesa Grande at the St. Louis fair, showing the two colors in the cut stone. These were declared the finest gems of the kind on exhibition. The mining of these stones at Mesa Grande is done principally by Indians who take great pleasure in seeking out the valuable crystals. There is a fascination about the seeking of value in the piles of worthless clay and quartz crystals, that appeals to the red man, and he is willing to work at low wages for the excitement of the thing and incidentally for what he can carry away. It might be said that it is not all that glitters that finds its way into the company’s strong boxes. The gangue of the Mesa Grande tourmaline is generally white opaque quartzite, the crystals penetrating in all directions. As depth is attained the colors become deeper and consequently more valuable. In mining the ledge material is removed with as much care as possible, and after being broken, is sorted and screened. This is done with great care, as it is a very easy matter to fracture a crystal that might be worth many times its weight in gold. There are many points in this section of the country where croppings can be seen that give as favorable indications of tourmaline as those at the Mesa Grande mine. 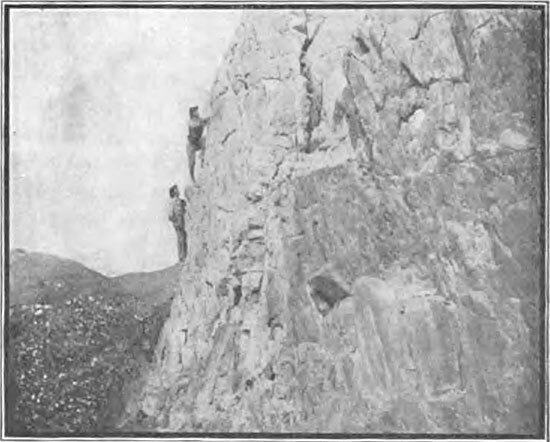 Several small pockets have been uncovered on Smith Mountain, and even as far as Julian pockets of lepidolite have been encountered. Near Ramona golden beryls were recently found which, after cutting, are matchless for their brilliancy. In the same district rose beryls, perfectly formed, were found near the surface. Some of these shipped to New York brought handsome prices. A few really high grade aquamarines, showing clear shades of sky blue and sea green, have been found, and there are many evidences to encourage the prospector. Garnets can be picked up in a dozen places, many found being clear and suitable for gem cutting. Spinel is known to exist in at least one locality, and this fact alone would be an inducement to seek for other treasures. Epidote, jade, turquoise, aragonite and zircons of the hyacinth variety, have also been found, though the country as yet has not been scratched over. Among the really unusual deposits found in this section is a ledge of palagonite near the San Isabel valley. Though not a true mineral, being an alteration of tufa, resulting through the agency of steam or hot water, its presence is notable, as rare in this region. It is named from the place it was first found in Italy. This deposit consists of a series of different colored ledges, each of which is well defined. They are continuous, the only line of separation being a marked change in their color. These ledges vary in width from five to twenty feet, forming a solid mass of material eighty feet wide. The natural colors of the higher grade varieties are umber, Indian red and sienna. This material when extracted is soft and can be cut with a knife, but when exposed to air it hardens and will take an excellent polish. Besides being available as a decorative stone, it can be used in the manufacturing of paints, paint filler, soap filler, sapolio, tooth powder, kalsomine, putty and polishing powder. Still another unusual and interesting deposit is found in the mountain range chiefly near the desert’s edge. It is a deposit of gabbro, granitoid, consisting chiefly of labradorite and pyroxene, containing hornblende and magnetite. Specimens of this orbicular gabbro have been polished and are truly beautiful. Were it possible to mine this in large quantities there would be a demand for it for decorative and ornamental work. In view of the fact that only the most meager investigations have been made of the mineral resources of this section, it is truly remarkable that so many rare and valuable minerals have been found. There are most promising indications to induce the mineralogist to seek for the hidden things and within a short time others may be brought to light. The recent discovery of rich deposits of tourmaline, a precious gem, in the Mesa Grande Mountains of San Diego County, California, has drawn the attention of the entire country, in fact, the whole world, to one of the most valuable properties in what has for some time been known as a rich mineral and semiprecious gem section. From surface indications of the country which has thus far been prospected it would appear that the extent and value of the properties now being developed will yield immense returns to their owners. 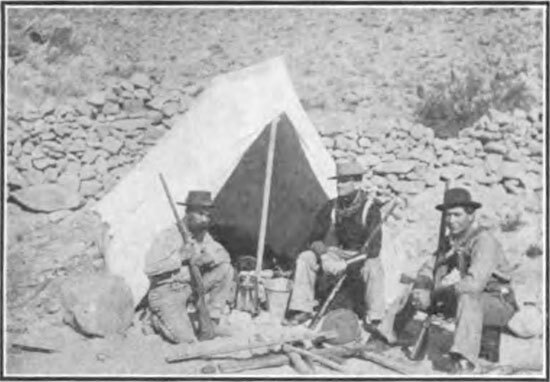 While it has been known for several years that tourmaline existed in various localities in San Diego County and several small mines have been opened from which a large number of the gems have been taken, until the “strike” in the Mesa Grande district was made, its value and extent was hardly realized. The tourmalines mined in this district are said to be far more valuable on account of hardness, color, and brilliancy than those found in Ceylon, Brazil, and the State of Maine. The prevailing color of the San Diego tourmaline is red and is found in shades running from a delicate pink to the deep rich color of the Burmah and Indian rubies. The green tourmaline is also found in large quantities. These two colors, the green and the red, are the most valuable and eagerly sought after by gem buyers. 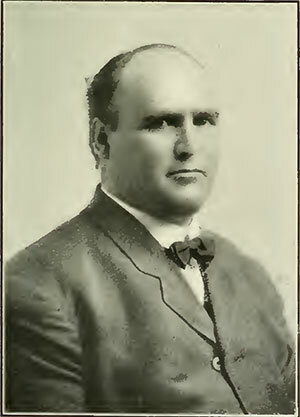 C. O. McCarroll, who discovered the largest piece of tourmaline known. In the history of the discovery of precious stones, particularly in the diamond-bearing gravels of Brazil, tourmalines have generally been found in connection with the topaz, amethyst and diamond, and as several of the latter have already been discovered in San Diego County, it is but fair to assume that it will only be a matter of time before the diamond will also be mined in California. “There are magnificent crystals of tourmaline, the rubellite (or ruby) variety predominating. This locality, however, differs from others in having the tourmaline in distinct, isolated crystals. Many of them are translucent, or even transparent, and occur as large separate crystals, with perfect prisms and terminations. The rubellite seems the predominating variety at Mesa Grande Mountain, but there is also a large proportion of parti-colored crystals—i.e., those made up of three, four, or five distinct sections, as at Haddam Neck, Conn., and Paris, Me. ; others present the Brazilian type, in which several different colored tourmalines appear, as though included one within the other. The mouth of a tunnel in a San Diego County, California, gem mine. 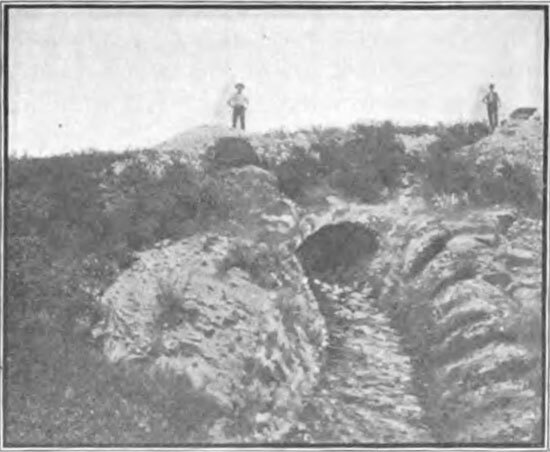 “There has been taken from one mine about $15,000 worth of gems, and six or seven thousand dollars’ worth were found within twelve feet of the surface. The best stones taken out are at a depth of fifty feet, and the predominating color is pink. Some of the last stones mined have more brilliancy than any stone except the diamond. “The cost of working these mines is less than that of any other class of mines. After being opened it will not be necessary to handle any waste. At one of the mines nearly $1,000,000 worth of gems have been mined at a cost of less than $6,000. Portion of San Diego County, California, where tourmaline mining is being carried on successfully. In addition to the tourmaline, rose beryl and other material that have been found at Mesa Grande is the spessatite garnet, found in garnet rock in brilliant crystals from five to fifteen millimeters in diameter. These are usually translucent, and, while they only furnish small transparent gems, possess great brilliancy and are in great demand in the gem market. In this article time and space will permit the writer to chip from the poetic gems of historical writings but limited illustration of the unison of the human mind in its adoration of the jewel from time immemorial, the greatest illustration of which is in the language of the tie that binds the ancient to the modern, the Jew to the Gentile—the Old Testament. That mighty genius, Shakespeare, in the “Merchant of Venice,” endows us with the celebrated “Caskets of Jewels” scene. Music, not to be outdone, ushered through the brain of that marvelous composer, Gounod, the jewel scene in “Faust” as her contribution. Mephisto, jealous of that matchless triumvirate, Holy Writ, Poetry and Music, and realizing that he could not beat that combination, slipped into tune and doffed his cap to the power of the jewel. In the march of the ages, first one country and then another has come to the front with its gem discoveries, but only recently has our own beloved America, the youngest of the grown-up nations, spoken. The last to speak, by no means the least; as the increasing attention of the jewelers of the world now being focused upon San Diego County, California, will prove. Australia has its opals, Persia its turqoises [sic], and South Africa its diamonds; but it has remained for this favored spot, the most southwestern county of the United States, to surpass, by far, any known locality in the world in the production of tourmaline, hyacinth and beryl. The progress which has been made in the mining and cutting of these gems has been little less than marvelous. Marvelous indeed! when you stop to consider that only a few years ago the existence of gems was entirely unknown in California. 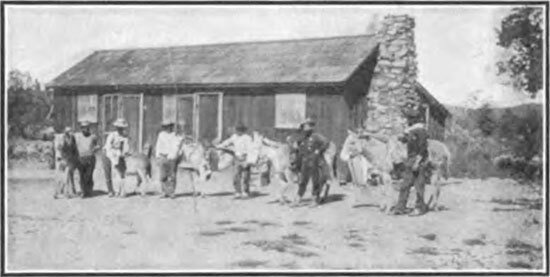 Today there are at least twenty mines being successfully worked, producing hundreds of thousands of dollars’ worth of gems annually, which are cut and polished in San Diego by the San Diego lapidaries. These gems, mined and cut by native sons, have been battling against competition not only in the United States, but they are at present forcing their way by superior quality and brilliancy of cutting into the markets of the world. San Diego County produces both the quality and the quantity, and with the realization of the anticipated developments now planned for the San Diego County gem field, San Diego must ultimately be known as the gem center and literally the gem city of the Western hemisphere. 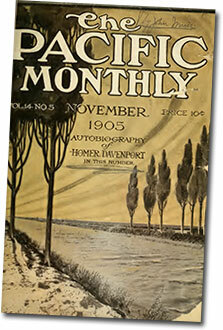 Years ago, during the early settlement of California, it was prophesied that California’s future greatness would be acquired from the superior natural advantages possessed by the soil and climate in the production of citrus fruits and as a retreat for the aged and invalids from the blizzards of the Eastern States. This alone seemed adequate to entitle California to the honor of being christened the Italy of America, and San Diego the Naples of the Pacific Coast, but since the discovery of gems, and as these unknown prospects were gradually developed into valuable mines, it has dawned upon the time-honored prophets that more important than all else are the vast stores of precious stones hidden away in the unproductive-looking ledges of San Diego County. But before going further, let us turn back to the time the first discoveries were made. We will speak first of the prospector. During the past, as at the present, the financial world has been in a great measure dependent upon the prospector to supply the source of investment which meets with the approval of the financial plunger and speculator. To these same prospectors is due in a large degree the credit for the distinction San Diego enjoys as a gem center. The gem district runs from northwest to southeast, across the west-central part of San Diego County, and this section of the country is rough and mountainous. The hillsides are mostly covered with dense, sprangling brush. 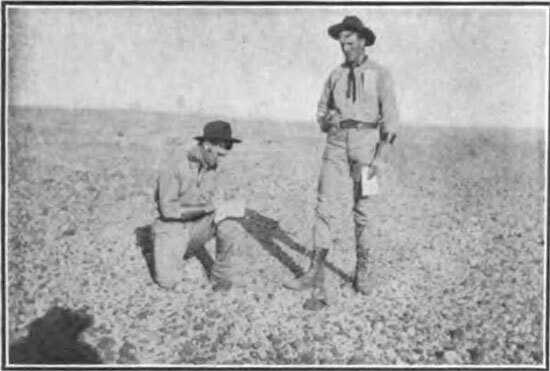 Prospecting is a peculiarly interesting study; for one must have not only a technical knowledge, but it is necessary to visit the various mining camps personally and thus practically study the formations, for no two gem districts are identical. It is frequently the case that men who hold large mining interests know very little nor care to know, much concerning the daily routine in the working of a mine. Neither would the man who understands the tempering of drill steel, the use of dynamite, or the hoisting and milling of ore, be successful as a prospector. The prospector, too, is invariably willing and prefers to turn over his undeveloped prospect to some one more specially adapted to that class of work than himself, and in turn go forth in search of surface indications of other deposits. Thus you will see that the promoter, prospector and miner are separate and distinct from each other; yet each is dependent upon the other for his subsistence. Prospectors in general, who first prepared themselves by necessary study and practical research, have been successful in finding the surface indications, which, when developed by sinking or tunneling on the ledge, have proven to be gem-bearing formations. That those mines in San Diego County, which have been developed or are at present being developed, have been and are profitable to their owners, must be admitted without question. 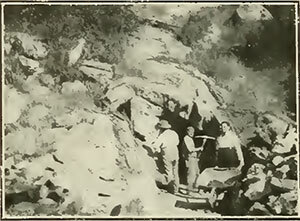 A few years ago at the time of the first discoveries and consequent exploitation of the present famous gem-producing mines, one of the leading mineralogists of the United States was consulted as to the possible extent of the gem deposits of San Diego County, and he stated as his opinion that it would be useless to attempt to mine for gems at a greater depth than twenty-five feet. 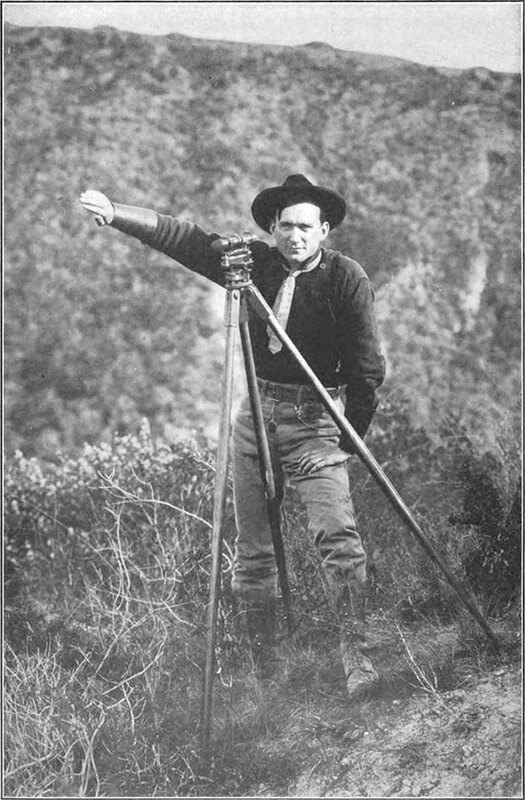 That this eminent authority was mistaken in his deductions is evidenced by the fact that at the present time there are gem mines in San Diego County which have been worked to a depth of one hundred feet, while the quality of the stones remains equal or superior to those found at a depth of twenty-five feet. It is therefore with a confidence born of actual experience by competent authorities, that the statement is made that the quality of the California gems and the vastness of the deposits in San Diego County is unexcelled by any other gem-producing area in the known world. There are more gems in the ground by countless thousands than have ever been taken out, and it would be safe to say that the present production will be looked upon as merely a scratching of the earth’s crust in the light of the greater development to come. THE GEMS OF SAN DIEGO COUNTY. Among the most beautiful and valuable gem stones found within the borders of San Diego County are the tourmaline, hyacinth and beryl. The tourmaline is one of the most wonderful and beautiful of gems; wonderful in the complex number of elements necessary to its crystallization, and beautiful in its many hues, ranging from pure crystal white to jet black, in every shade of every color. Its colors are at times blended, and as many as three distinct colors occur in one crystal, usually in transverse sections, but sometimes in distinct layers or coatings, the center being red and the outside green, or vice versa. There is evidence that these deposits were known and valued by the Indians long before they were discovered by the white man. Arrowheads of clear-colored tourmaline have been found in the vicinity of the present mines, while old graves are decorated with them, and quite frequently rounded tourmaline beads have been found buried among the property of the departed. Although not possessing the range in color of the tourmaline group, the hyacinth runs in various shades from a light straw and golden yellow into a deep crimson, or columbine red, and has a brilliancy second only to the diamond. The true hyacinth is the zircon of mineralogy, and this is what has recently been discovered in San Diego County, but the hyacinth of commerce is mostly derived from varieties of garnet, the essonite being cinnamon colored, the succonite being straw or amber colored, and the spessartite being brownish red: Thus to the ordinary observer the difference in the brilliancy of the true hyacinth over the commercial substitute becomes at once apparent. In the Southern California gem belt these hyacinths occur crystalized in a higher and more perfect condition than those found in any other locality on the globe. The commercial hyacinth, heretofore used, is readily fusible, but the San Diego hyacinths are practically infusible. Our wonderful hyacinths seem to have imbibed the sunshine of California’s balmy clime. The largest hyacinth stone yet cut weighs a trifle over six carats, and was recently sold for $500. There are four members of the beryl family, the best known of which is the emerald, a green beryl colored by oxide of chronium [sic] and valued higher than the diamond. This variety has never yet been produced in San Diego County, but the other three varieties have been found in their highest and most perfect form of crystallization. The golden runs through the different shades of yellow, from light straw to deep golden. The aquamarine is the color of deep ocean water. Last, but in reality the rarest of all, is the rose beryl, the color of the petal of the wild rose. The largest known rose beryl, weighing thirty-two and nine-sixteenth carats, with almost the brilliancy of the diamond, and without a flaw, has been produced in San Diego County. This gem is 8, or second to the diamond in hardness, and is valued at $750. Rose beryl has heretofore been found sparingly and was too rare to become generally known until the lid was raised from the gem casket in San Diego County. 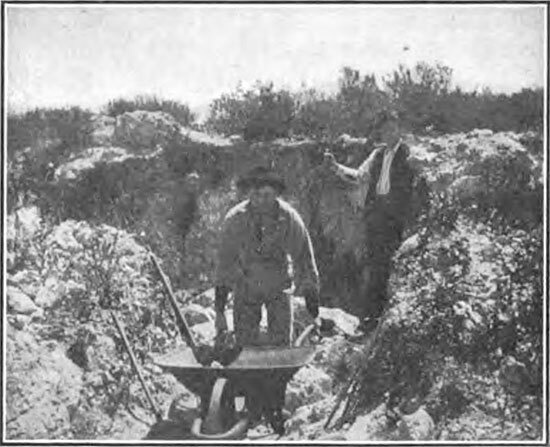 The method of cutting gems in San Diego is the method of the new world—the twentieth century process, cutting entirely by machinery manufactured expressly for the work, with such improvements as have been found to be best adapted to this field. To the improvements controlled and used only by the San Diego people are due the advanced methods that make the Southern California gems today occupy such an exclusive position in the gem world, acmes of brilliancy and perfection of design. After a gem has been received at the lapidary, the rough stone is first carefully washed and then put through what is known as the roughing or shaping process, to get it in an approximate working shape before placing it in the little grinding machine known as the “Hand Piece.” Next, an exacting microscopic examination is made of the stone to locate any possible flaws in the gems themselves, which are embedded in the rough stone. If no flaws are found, it is next placed in the “Hand Piece” referred to above, and is speedily transformed from an unprepossessing stone to a beautiful and brilliant gem. This little machine—the “Hand Piece”—does its work with such accuracy that it will cut to the one-hundredth part of an inch, registering the degrees from 0 to 90. The brilliancy of any cut stone depends upon three things, viz: first, the stone must be transparent and free from all flaws; second, and most important—in order that the stone may be brilliant—are the angles at which the facets are cut on the stone. These little planes (polished surfaces) called facets, arranged in rows around the stone, serve as mirrors, causing the sides and the back of the stone to reflect the light forward, while those on the top serve to break the light up into smaller reflections. These facets must be arranged proportionately in order that a brilliant effect may be secured. For instance, if the top facets are cut at an angle too steep in proportion to those on the bottom, the light will be diverted and a dead spot will appear in the center of the stone, or vice versa. To cut a stone to correct proportions, without undue waste, is the work of a genius—an accomplishment not to be acquired, but born with the operator. It is a problem requiring patience, diligence, a trained eye, but above all, a natural instinct of harmony of color, design and effect. The third and last essential in the production of a perfect gem, is that relating to the polishing process. This part of the work does not require the fine discrimination in judgment, nor yet the diligence which the cutting calls for. It is necessary, however, that each facet have a perfectly flat surface and not be rounded off, as is the procedure with most European cutters, who cut and polish the stones by hand on wooden laps, with which there is necessarily more or less oscillation, thus preventing the insurance of a perfectly flat surface. The rigidity with which American machines are constructed has a tendency to hold the stone solidly in its place while being polished on a metal lap, and has the effect of securing an absolutely plane surface, as rounded and poorly polished surfaces do not reflect bright lights. The Himalaya tourmaline mine, at Mesa Grande, is owned by the Himalaya Mining Co., of New York. The company’s agent in charge of the property is J. Goodman Braye, Jr., who was born in Australia, of African parentage, and who came to America when only a lad to make his fortune. He is now in sole charge of the greatest tourmaline mine in the world, so that his career furnishes proof that the accident of race or color is no bar to achievement in this country. Externally the Himalaya tourmaline mine is as commonplace and uninviting as any coal mine. 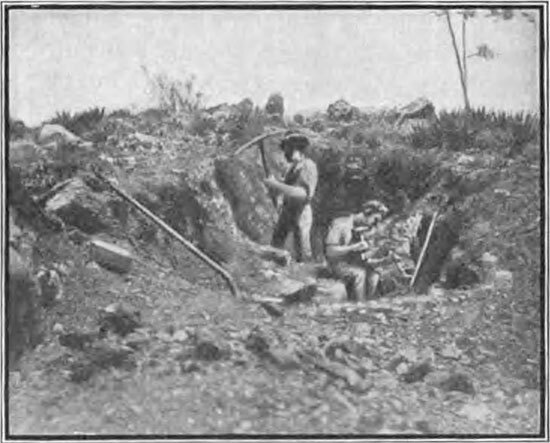 From 1898 until 1905 operations were conducted by surface or bench digging. Then the overburden of earth became so great that its removal was unduly expensive, and in the rainy season trouble was experienced with the caving in of the sides, so a tunnel was driven for a distance of several hundred feet, following the gem-bearing vein the whole way. This vein varies from 18 inches to nearly 4 feet in thickness. The tourmaline occurs in irregular pockets, mingled with talc, hydrous mica, and an extraordinary variety of other minerals, some of which possess some value, while others are worthless. Among these are lepidolite, quartz crystals, orthoclase, spodumene, muscovite, beryl, hornblende, spessarite and essonite garnet. The entire mass of material in the pocket is removed, taken outside in mine cars, and conveyed to the washing plant, which is remarkable only for its simplicity. A hose is first turned upon the material, which sufficiently clears the large crystals and other minerals for their identification. Many of the small crystals are covered with tightly adherent talc and clay; so that the mass of small, broken mineral is placed in a suspended barrel, to which a hose is attached, permitting a steady stream of water to be poured in. An outlet in the end of the barrel permits the escape of the water. The barrel is shaken vigorously for as long as may be necessary for the removal of the clay and talc, and the material is then emptied upon trays. The tourmaline crystals and other gem materials worth saving are then picked out by hand. The tourmaline crystals are sorted with respect to size and quality, varying from small, pencil-like crystals, not more than an eighth of an inch in diameter, up to crystals 2 or 3 inches in diameter. In these crystals almost all the colors of the rainbow may be found. Tourmaline is known by various names, depending upon the color. The red or pink transparent variety is called rubellite; the violet-red, siberite; the blue or bluish-black, indicolite; Berlin blue, Brazilian sapphire; green, Brazilian emerald; yellow or amber is known as Ceylonese peridot; colorless tourmaline as achroite; black, with resinous fracture, as aphrizite; and brown or greenish-black as dravite. All these varieties are found at Mesa Grande. It is difficult to make a general statement of the value of tourmaline as a gem material, this depending upon its freedom from checks and flaws, its transparency, color, luster, and hardness. The great mass of tourmaline as it comes from the mine is worth but a few cents a carat, on account of checks, cracks, bubbles or lack of transparency, or the colors being too pale. Whatever value such material has as a jeweler’s material arises, in the main, from the cutting. But flawless tourmaline, of exceptional hardness, suitable for cutting in the same manner as diamonds is worth from $5 to $20 per carat. Material has been taken from the Himalaya mine that no one but an expert could tell from ruby; and specimens of green tourmaline are sometimes found that almost rival the emerald in appearance. So while some crystals are worth no more than quartz crystals or garnet, others of exceptional hardness and coloring nearly rival the diamond in value. The range of hardness is great, some specimens being 7, some 7.5 and some 8, in the scale in which the hardness of the diamond is 10. China offers a ready market for all the pink tourmaline not readily absorbed by the American and European demand. Late in June the sale to Chinese dealers of many thousands of carats of this material from the Mesa Grande, was reported. Every year (in common with most other highly colored gems) tourmaline is coming more and more into favor, and is enhancing in price. However, in this country it does not yet enjoy the popularity it merits, as a distinctively American gem. One advantage it possesses is in the fact that it cannot be successfully imitated, owing to certain peculiar optical properties. Plates cut from transparent crystals, parallel to their length, are much used in experiments in optics, on account of their remarkable polarizing action on light. Tourmaline is found in Burmah, India, Siberia, Germany, Brazil, Maine, Massachussetts [sic], Connecticut, New York, and California; but in most sections its occurrence is haphazard and uncertain, not justifying systematic mining operations. Nowhere are gems found so abundantly or of such remarkable size, beauty, richness and variety of coloring as at Mesa Grande. 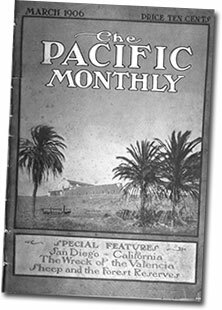 Only the Himalaya and San Diego mines are in operation, but the Esmerelda [sic] mine, a mile and a half distant, has yielded some fine gems and may give a good account of itself hereafter. Numerous other prospects have been located in various parts of San Diego and Riverside counties, but their value is problematical.